This September, WonderGlass will collaborate with WOHA to launch the OLI light series at Maison et Objet, Paris, from 8-12 September 2017. Inspired by the harmonious geometry of Asian stupa architecture, OLI will be the lighting element of the WOHAbeing pavilion that presents new craft-focused products by the Singapore-based architecture practice. OLI (from the Sanskrit word for the “glow of a lamp”) is a light that draws on the principles of balance and harmony in Asian stupa architecture to create a series of modular lights, in glass and bronze. Its modular design provides beautiful possibilities from a single, subtle glow in the darkness to complex assemblages floating in space; in pyramid, linear and stackable formats. The basic light component is a delicate glass bead, fixed to a metal rod, which comes in a concave or convex shape. “WonderGlass has explored the juxtaposition of Asian culture with contemporary design in previous projects with designers such as Nao Tamura and Marcel Wanders, and we are proud to continue this journey with this new collaboration with WOHA,” Maurizio Mussati, founder of WonderGlass comments. 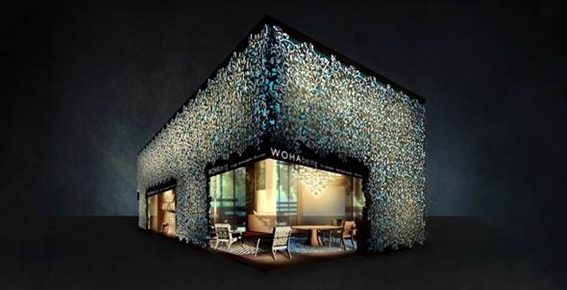 WonderGlass, the contemporary glass lighting company who specialise in hand-blown glass lighting, were selected by WOHA to collaborate on the WOHAbeing project for their dedication to craftsmanship and skills. OLI will feature as the lighting component of WOHA’s new showcase of furniture, accessories and lighting products, created for the WOHAbeing pavilion at Maison et Objet. This range provides a distinct visual language that combines ancient and modernist design vocabularies. WOHAbeing is about living well by living simply and sustainably, and celebrating the beauty of our world. It is about making and craft, balance and proportion, and about texture, colour and form. 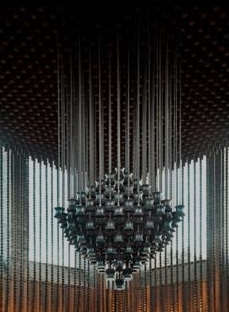 It draws inspiration from the past, makes connections to the rich tapestry of cultures that surround us, and proposes how we should live in the future. “The objects around us must draw together our cultural history, our sense of place, and our contemporary needs, in doing so, they will be authentic and possess their own unique beauty,” Mun Summ Wong and Richard Hassell, Directors of WOHA, explain. The OLI light will be exhibited at WOHAbeing pavilion at Maison et Objet, 8th-12th September 2017, then at the National Design Centre, Singapore, for all of December 2017 in a homecoming exhibition. 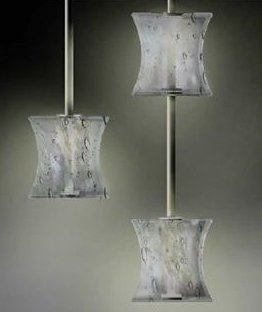 Posted in New Products and tagged furnishing international, OLI light, woha, WonderGlass. Bookmark the permalink.